Students can choose from 29 majors and can also pursue minors and interdisciplinary minors to complement their majors. Through the Davidson Research Initiative (DRI), students can participate in collaborative research projects between faculty and students during the summer. Students interested in engineering can participate in a 3-2 program with Columbia University and Washington University, earning both a BA from Davidson and a BS in engineering. A 4-2 program is also offered. The pre-med program assists students in realizing their goals in the health professions. The pre-law program helps students explore the legal profession. Over 80% of students study, live, work or travel abroad. 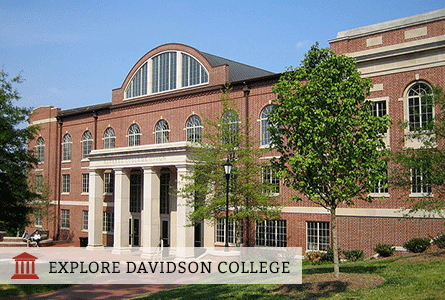 80% of Davidson alumni attend graduate or professional school within 5 years of graduating.